China, Ching Dynasty. T'ai P'ing Rebellion, 1850 to 1864. 1 cash. S-1606. The T'ai P'ing rebellion started during the reign of Hsien-Feng in 1850, and ended under T'ung Chih in 1864. The leader of the Rebellion was Hung Hsiu-ch'uan who had not only converted to Christianity, but came to believe his was actually the son of God and brother of Jesus, and was attempting to establish a Christian but Communist style state, with himself as the supreme leader. Leader : Hung Hsiu-ch'uan . Date : issued between 1861 and 1864. Reference : Hartill 23.19. S-1606. Size : 25.0 mm. Weight : 4.87 grams. 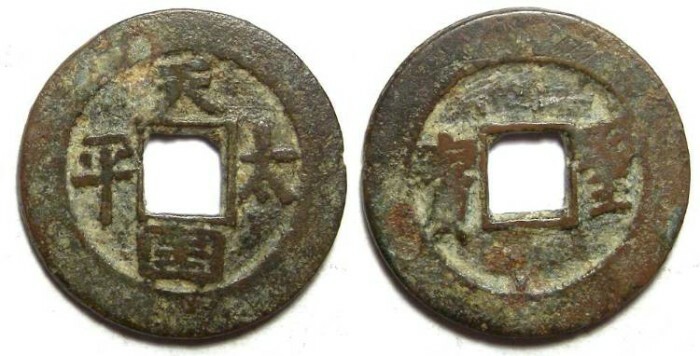 Obverse : "Tai Ping Tian Guo" meaning Taiping Heavenly Kingdom. Reverse : "Sheng Bao" meaning Sacred Money.